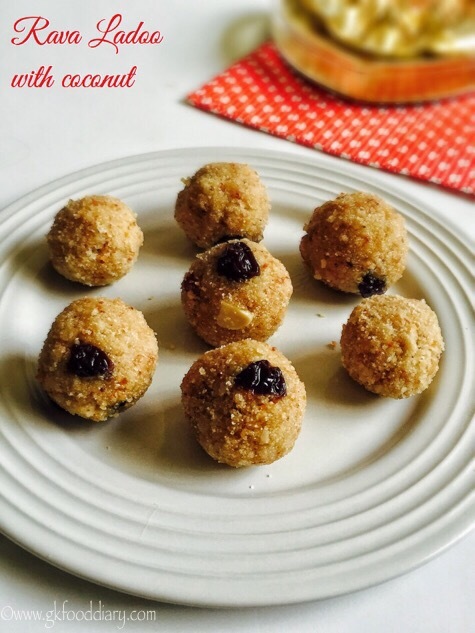 Here is how to make delicious rava ladoo recipe for toddlers and kids. 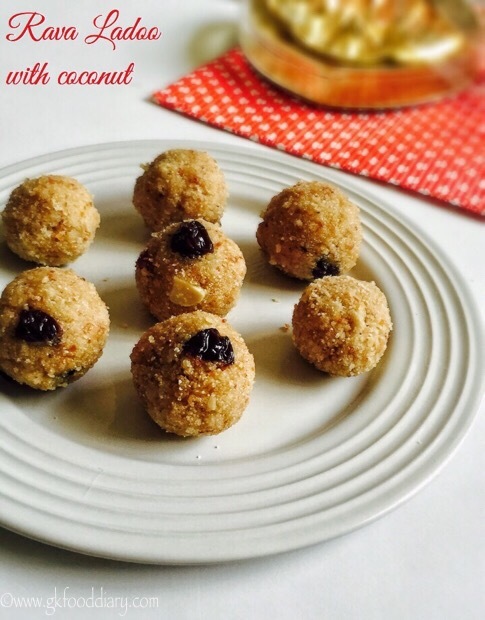 Rava ladoo/Rava laddu- Delicious ladoos made with cream of wheat aka sooji. Sweet treat for kids. Firstly, add sugar and cardamom to the blender. Grind it to a smooth powder. Measure and keep all the other ingredients ready. 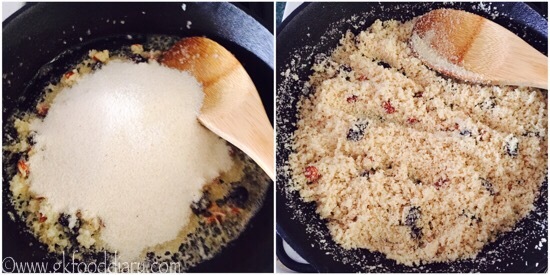 Melt ghee in a thick bottomed pan. Add cashews and raisins. Fry until the cashews turn golden brown. Then add grated coconut and add roast it until its light brown. Now add 1 cup of Rava and roast in low flame for 7-10 minutes until nice nutty aroma comes and rava turns slightly brown. Then add powdered sugar and mix everything well together for a minute. Switch off the flame once done. Now add ¼ cup of hot water to the rava mix and mix well. 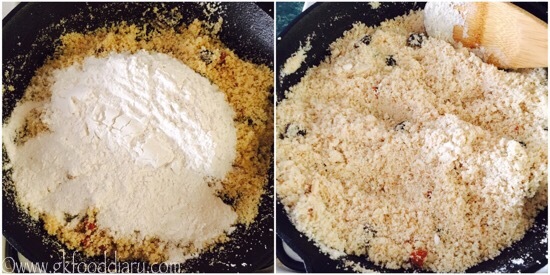 Add more water if the mixture remains crumble. Start making ladoos with your hand. 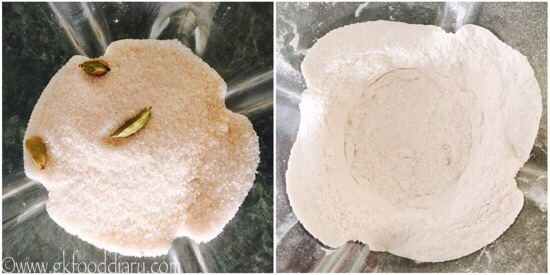 Add 2 -3 tbsp of hot water if the mixture become crumble while making ladoos. Store it in an air tight container once done. 1. Firstly, add sugar and cardamom to the blender. Grind it to a smooth powder. 2. Measure and keep all the other ingredients ready. Melt ghee in a thick bottomed pan. 3. 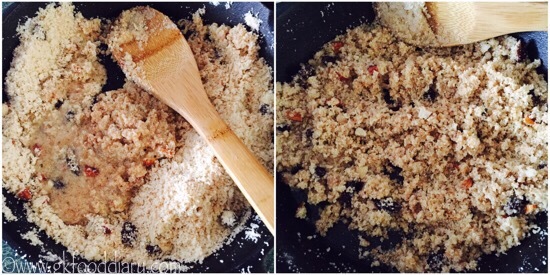 Add cashews and raisins. 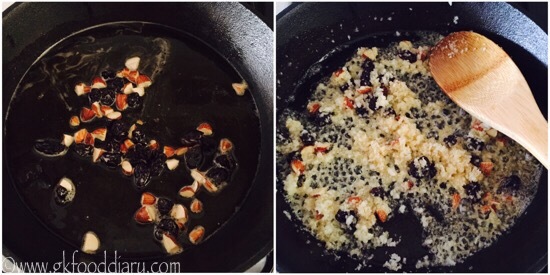 Fry until the cashews turn golden brown. Then add grated coconut and add roast it until its light brown. 4. Now add 1 cup of Rava and roast in low flame for 7-10 minutes until nice nutty aroma comes and rava turns slightly brown. 5. Then add powdered sugar and mix everything well together for a minute. Switch off the flame once done. 6. Now add 1/4 cup of hot water to the rava mix and mix well. Add more water if the mixture remains crumble. 7) Start making ladoos with your hand. 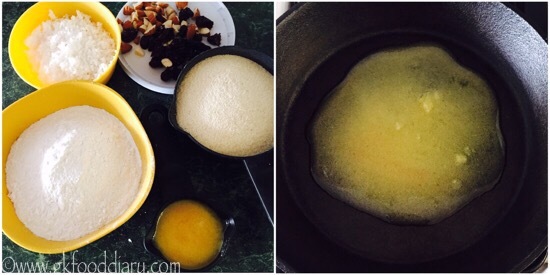 Add 2 -3 tbsp of hot water if the mixture become crumble while making ladoos. Store it in an air tight container once done. 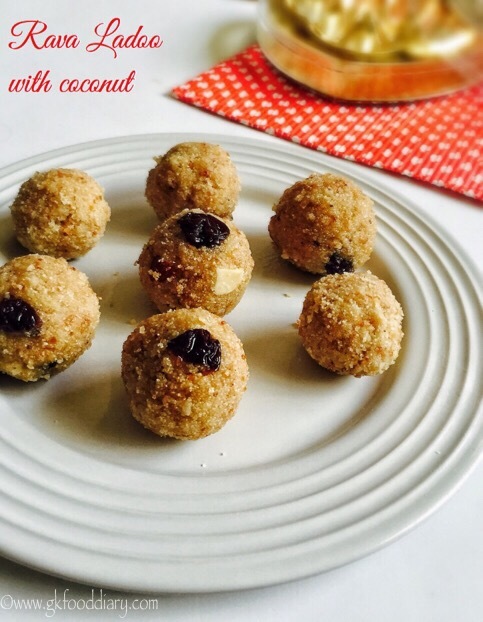 The tasty rava Ladoo is ready! 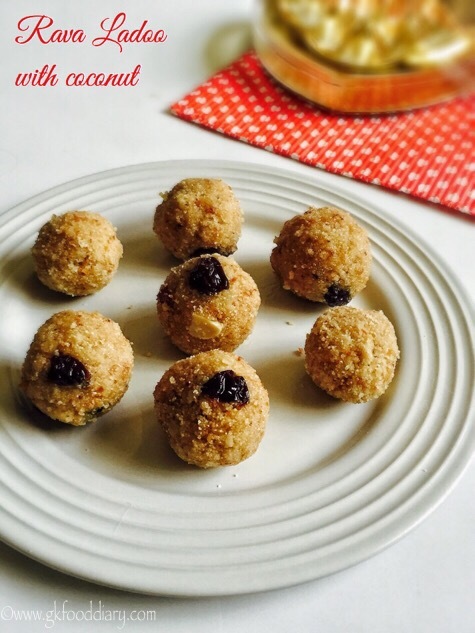 Add 1 or 2 tbsp of hot water if you are not able to shape ladoos at the end. Do the entire process in low flame in order to prevent the rava from burning. Do not add 1/2 cup of hot water at once, add little by little. When you are able to make ladoos, stop adding hot water. Store the ladoos in a air tight container at room temperature. It stays well 2-3 days. Avoid whole cashews and raisins for small kids. You can add powdered nuts instead. 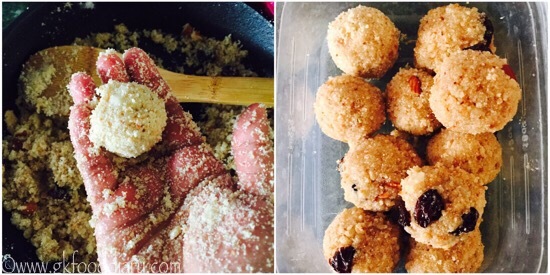 Make sure to introduce everything separate to your baby before you try this sooji ladoo.